GEPR HOME >Three Proposals to Avoid a Solar Bubble. Three Proposals to Avoid a Solar Bubble. [Overview] The purchase price of solar energy of 42 JPY per kilowatt hour under the feed-in tariff (FIT) for renewable energy, which will go into effect in Japan beginning in July, is comparatively high relative to the international price, and this has the potential to lead to a bubble. The system itself is questionable due to an influx of cheap Chinese products and its failure to stimulate domestic industries. Should this system go into effect, to avoid a bubble it will be necessary to include mechanisms in the system to 1) adjust the purchase price downward frequently to correct for differences between foreign and domestic prices, 2) compile data on solar panel prices and energy production prices, and 3) increase transparency in the cost allocation review process. However, when one observes the market price on the global market, 42 JPY is too high. If Japan purchases energy at the high price of 42 JPY over the long term, it is inevitable that we will repeat the mistakes of European countries and put the burden of paying for the PV bubble on the average citizen through increased energy prices for end users. Moreover, it will not stimulate Japan's domestic industries. On the contrary, this high rate of 42 JPY will send an incorrect signal to Japanese PV manufacturers to increase production of general-use products (crystalline silicon types). This may result in improved revenue in the short term, but in the long term, they will lose the price competition with Chinese manufacturers and likely fall into a decline. This article asserts that under the current conditions, Japan's FIT will end in a result of "chasing after two hares and catching neither." Therefore, I suggest the three following proposals to improve the FIT, (1) to reduce the PV purchase price at two month intervals to correct for differences in foreign and domestic prices after one year (Table 1), (2) to compile price data and (3) to increase the transparency of the cost allocation review process. Less than 10kW 42 JPY/kWh 10 years* Less than 10kW 42 JPY/kWh 10 years 1) To suppress a bubble caused by installations of PV on the roofs of supermarkets, factories etc. with short lead time (On the other hand, ground-based installations such as mega-solar have a lead time of approximately one year, and thus a year of price updates should be sufficient to suppress a bubble). 2) To abandon short term profits for Japanese manufacturers and reduce costs by opening the market to overseas manufacturers from countries such as China. Reduce price at two month intervals until parity with Germany at 20 JPY/kWh after one year*. *For home use, when the extant subsidy of 35,000 JPY/kW is taken into consideration, the actual amount is 48 JPY/kWh. Reduce price at six month intervals until parity with China at 13 JPY/kWh after one year*. Prices will be reduced in response to differences between international and domestic prices. Regarding the primary goal of the FIT "to reduce costs by creating a market via policy," prices did indeed fall dramatically when Chinese manufacturers flooded the global market by increasing production with the expectation of an expanded market due to the FIT in Europe. However, at the current point in time when crystalline silicon production techniques are widely available, economy of scale cannot be expected. The global cumulative capacity has increased from 13,430 MW in 2008 to over five times that amount at 67,350 MW in 2011, with 80% of that capacity in Europe. Over the same period, cumulative production rose from roughly 19,000 MW to more than 92,000 MW, with a surplus supply of capacity (a stockpile) of in excess of 25,000 MW. Manufacturers in China and Taiwan were responsible for this sudden increase in production over this period. The share of annual global production held by these two countries rose from approximately 30% in 2008 to 74% in 2011. Chinese manufacturers in particular account for four of the top five producers. The unit price of PV products fell rapidly due to the massive stockpile that resulted from this increase in production. According to the magazine Photon, in Germany the price of modules fell by roughly two-thirds over the three years since 2009. The spot price of modules has fallen from 2.7 EUR/W in January 2009 to 0.8 EUR/W in January 2012. As the system price is roughly double that of the module price, Germany’s PV system price has fallen from around 4,500 EUR (450,000 JPY)/kW in 2009 to below 200,000 JPY/kW at the start of 2012, or roughly a third of that price, over three years. The same prices in Japan are at a level of 4~500,000 JPY/kW, or more than double the international price. While it is possible that prices may continue to decrease temporarily in the future due to the large stockpile, the margin for reduction of fixed costs through economy of scale is limited. This is because the techniques for manufacturing crystalline silicon PV products, which have become the current standard, are widely available. The majority of the cost is the variable cost of materials, and the margin for improving conversion efficiency is also limited. Consequently, even if Japan were to create a market via policy through the FIT, it is unlikely that international prices of PV products would decrease. 3. It will not promote development of Japanese industries. Next, what about the FIT’s second objective of promoting industry? PV can be divided loosely into the upstream (silicon components, manufacturing of cells and modules) and downstream (system integration, power generation and so on). As many informed individuals have pointed out, manufacturers of PV cells and modules in industrially advanced countries earn almost no profits. For example, the share of global production held by Japanese PV manufacturers exceeded 50% in 2005, but in 2010 it had fallen to 9%, and the volume of exports had fallen as well. 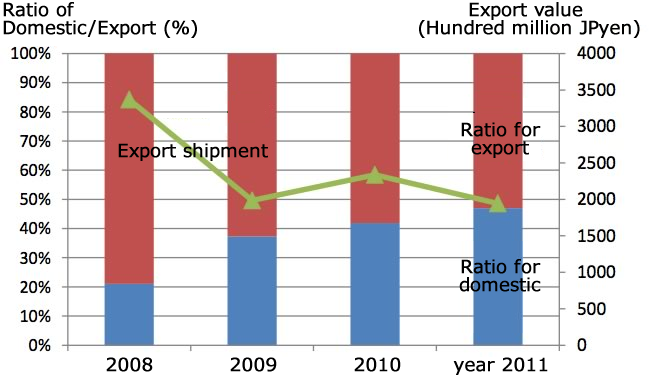 In Figure 1 the bar graph shows the proportion of domestic and export sales volume of Japanese manufacturers, while the line graph shows the value of export sales. In 2008, 80% of the production was exported, with a value of approximately 340 billion JPY. However, with the sudden drop in the unit price of products caused by the previously mentioned entry into the market by Chinese manufacturers and their increase in production, the international competitiveness of Japanese manufacturers has declined significantly. As exporting became difficult, the proportion of domestic to export sales became almost equal in 2011, and the value of exports fell to approximately 190 billion JPY. This is not limited to Japan, but is common across all industrially advanced countries. Germany’s Q Cells SE, who once boasted the highest production in the world, lost in the price competition with Chinese manufacturers, and went bankrupt in April 2012. Source: Export value figures are from the Japan Tariff Association foreign trade statistics, PV sales figures are from the Japan Photovoltaic Energy Association (JPEA). In other upstream fields, Japanese companies had been strong in surface protection materials and back sheets, but more and more local companies are entering the market in China. This should be interpreted as rapidly declining international competitiveness. Therefore, the Ministry of Economy, Trade and Industry stresses the downstream field of system integration (SI) as the means of survival for Japanese companies. SI involves designing systems, procurement of modules and inverters, or the generation of power. Companies such as Sharp have begun to expand from upstream to downstream operations. However, because PV is more expensive than traditional power sources, no matter how far Japanese companies expand their SI operations domestically, it will only result in an increased financial burden on citizens through the FIT. Consequently, though it is important for Japanese companies to earn profits overseas going forward, their entry into the market was too late and their international competitiveness is low at this point in time. When one looks at the top 15 ranking of the latest global rankings of PV SI businesses according to IMS Research, not a single one is a Japanese company. First Solar, ranked third in the world in cell production in 2010, is ranked seventh in SI. SunEdison, ranked fifth in SI operations, has already announced plans for a mega-solar project in Japan. When viewed from an international perspective, the SI business model in which profits are earned by procuring inexpensive components and providing maintenance management services or power generation is a field to which Japanese companies are not good at in the first place. It will be no simple matter for Japanese companies to focus on overseas expansion and produce profits. 4. The high purchase price will lead to a bubble and ultimately fail. The large-scale introduction of PV caused by the FIT gave manufacturers in China and Taiwan an opportunity to enter the market. The reduction in prices of PV panels that this caused was a desirable effect. However, the creation of a market via policy went too far and brought about a PV bubble. According to Chapter 4 of the IEA’s Policy Considerations for Deploying Renewables 2011, among other sources, the causes of the PV bubble were (1) short lead time, (2) limited price monitoring by government agencies and (3) excessively high purchase prices. For PV, the amount of time necessary from planning to beginning operations is much shorter than other forms of renewable energy at approximately two months for rooftop units and approximately one year for ground-based units such as mega-solar. In European countries, policymakers were unaware of an appropriate price and set the purchase price too high, and as a result, in exchange for a large capacity, the financial burden on end-users was increased. The solutions to this problem that have since been put into action were to restrict capacity, frequently reduce the purchase price and abandon the FIT. For example, in Germany, which boasts the highest PV capacity in the world, it was decided that the purchase price would be reduced at monthly intervals. Germany’s cumulative capacity rose from 6,000 MW in 2008 to just under 25,000 MW in 2011, with around 7,500 MW installed in the year of 2011 alone. Therefore, in April 2012, the purchase price was modified significantly. There are three points involved in this, (1) reducing the price by 20–32% from April onward, (2) reducing the purchase price by 1% per month beginning in May and (3) and adjusting the size of the reduction should the annual new capacity target (2,500–3,500 MW) be exceeded from November onward. 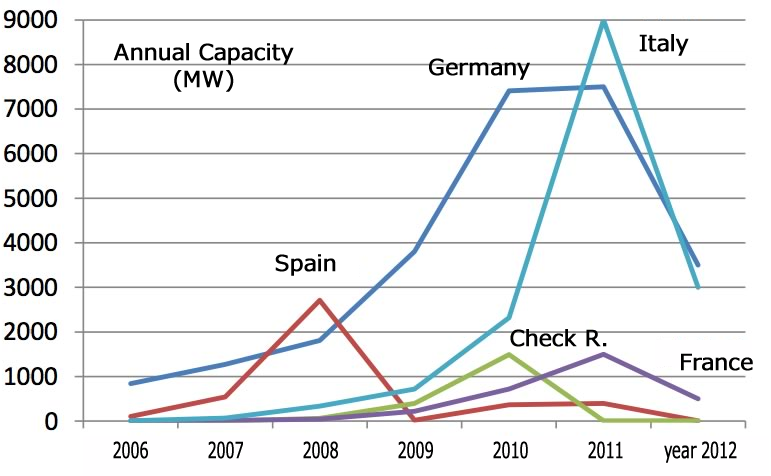 Similarly, Spain, the Czech Republic, France and Italy have also experienced PV bubbles (Figure 2), with sweeping systemic changes following one after the other. Spain is the most extreme example, having decided in 2012 to cease all new installations after having enacted restrictions on new capacity and a large reduction in the purchase price in the wake of a bubble. As of 2007, Spain had an installed capacity of 700 MW, but this rose sharply to approximately 3,500 MW in 2008 as a result of the high purchase price. Thereafter, as a result of limiting new capacity (1,500 MW) and reducing the purchase price by 30% in 2009, capacity in that year fell by 100 MW. Afterward in February 2012, the Spanish Parliament decided to discontinue the FIT for new installations. This was due to the fact that the financial burden resulting from the FIT had increased (roughly 500 billion JPY annually) and as the government was not permitted to shift the cost to electricity bills while in the midst of an economic crisis, this resulted in a massive budget shortfall making it difficult to maintain the system. Other European countries have made similar modifications to their systems. The Czech Republic has abandoned the FIT, while France has changed to purchase price reductions at three month intervals for amounts less than 100 kW and a bidding system for amounts greater than 100 kW. Italy installed 9,000 MW of new capacity in the year of 2011, and intends to reduce the purchase price by 32–36% and limit new capacity to 2,000–3,000 MW per year. 5. A system design proposal to avoid a PV bubble. The three following revisions to the Japanese FIT system design are necessary based on the lessons learned from Europe. The current FIT law states the purchase price is decided by the Minister of Economy, Trade and Industry before the start of each fiscal year, and will be decided semiannually if necessary (Article 3). As the purchase price of 42 JPY is too high, it must be set at a level that corrects for the difference in domestic and international prices. Even the IEA report (Box E.1) recommends updating prices based on benchmarks of the lowest priced modules and systems on the global market. Specifically, (1) after distinguishing between rooftop installations and ground-based installations of PV greater than 10 kW, (2) reducing the purchase price for roof-top types with short lead time at two month intervals and reaching parity with the German FIT rate of 20 JPY/kWh after one year and (3) reducing the price for ground-based types to parity with the Chinese FIT rate of 13 JPY/kWh after six months to one year. The primary objective of this proposal is to suppress a bubble caused by the short lead time installation of PV on the roofs of supermarkets and factories (Conversely, for ground-based installations such as mega-solar, the lead time is approximately one year, so the price adjustment after a year should be sufficient to suppress a bubble). The secondary objective is to abandon short term profits for Japanese manufacturers and prioritize reducing costs through participation in the market by foreign manufacturers in China and other countries. As stated previously, the manufacturing techniques for crystalline silicon components are widely available, and Japanese manufacturers cannot expect to win a price competition with Chinese competitors. A major obstacle for the procurement cost appraisal committee’s decision on the purchase price was a scarcity of compiled data on pricing. Under the Japanese FIT, the purchase price is based on “recognized typically required expenses and the estimated amount of renewable energy related to said provision.” In other words, because the expenses are referenced separately for each technology, this works as an incentive for companies to report the highest expenses possible and drive up the purchase price. Consequently, when deciding the purchase price, the expense data submitted by companies should not be taken at face value, and it is necessary to increase objectivity and transparency by using databases compiled by public agencies and market research firms. For example, in the USA, progress is being made to accumulate data in Tracking the Sun, a report by the Lawrence Berkeley National Laboratory, and comprehensive analytical results such as mean prices and standard deviations are published. With this sort of data, they are able to exclude the top 10% most inefficient projects when calculating the purchase price and provide an incentive for companies to be efficient. As was made apparent by the precedent of Germany, cost effectiveness is the most important factor in evaluating the FIT. In the current appraisal by the procurement cost appraisal committee, by increasing the current renewable energy capacity of about 19,450 MW by 2,500 MW in 2012, the surcharge applied to electricity bills will amount to 0.2–.4 JPY/kWh, or roughly an additional 70–100 JPY per month for the average monthly household electricity bill of 7,000 JPY. With the price of PV falling and an increased financial burden due to increased capacity, the future purchase price is unclear and difficult to forecast. However, there is sufficient room for improvement in the disclosure of data on cost allocation. At the very least, for each form of renewable energy, the expected capacity, annual total cost, CO2 emissions reduction cost and electrical grid stabilization cost should be disclosed in as much detail as the fourth report by the project team on purchasing all renewable energy. For example, the total annual consumption of electricity in Japan is roughly 1 trillion kWh, so with the previously mentioned surcharge of 0.2–0.4 JPY/kWh in 2012, one can deduce a total annual cost of 200–400 billion JPY, but one cannot deduce the cost of CO2 emissions reduction. Conversely, the trial calculations in Case 4 by the same project team are similar to the current FIT, and the basis for these calculations could be displayed in a format such as Excel data. Furthermore, it is possible to give a rough estimate of the cost of expanding the power grid, such as additional power transmission facilities. For example, if the capacity of PV exceeds 10,000 MW, it is said it will be necessary to expand the grid. The annual cost of expanding the grid if the PV capacity reaches 28,000 MW by 2020 has been estimated at 220 billion to 3.18 trillion JPY in 2020. As described above, the large-scale installation of PV in industrially advanced countries due to FIT did indeed reduce the unit price of PV products, but conversely also meant a decline in export profits, and demonstrated that it was not possible to “catch two hares” and stimulate domestic industries. If Japan sets the purchase price to 42 JPY under these circumstances, it will only result in either the stockpile of the global market flooding in or a continued massive introduction of the cheapest crystalline silicon components in the current market, which will not contribute to technological progress or stimulate Japanese industries. At a glance, the FIT gives the illusion of balancing the environment with the economy. This is because it appears that it will stimulate current investment in renewable energy, temporarily increase the profits of related companies and create jobs. However, one must not forget that the true nature of the FIT is to extend the purchase period over 15–20 years, and that this will simply delay the financial burden until a later date. An excessively high purchase price must be avoided at all costs. Consequently, mid-to-long term technical development of new technologies such as dye-sensitization is critical for Japan. However, as one cannot predict future technological advancements, it is important that government policy be to diversify investments over multiple projects and cut back or abandon them based on repeated evaluations. 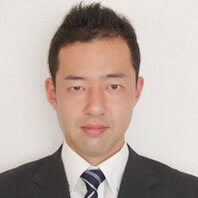 Author of “On Renewable Energy Policy” (Energy Forum Journal 2011). View other articles by the author at the website linked below.